As the Internet of Things (IoT) continues to grow, it will become an ever more important tool for small businesses to utilize to improve their internal operations and more efficiently serve their customers. In this blog post, we’ll discuss 5 important ways the IoT can help your small business succeed. The concept of the IoT involves the power of the internet to connect every imaginable device, machine, or structural component (most things you can think of!). This ever-growing network increases the connections of people to things, things to things, and enhances the relationships between people everywhere as well. Through the use of sensors, electronic tags and labels, and other technology, the IoT makes it possible to automatically collect, share, and use valuable data. The application of smart technology and improved artificial intelligence (AI) increasingly widespread in household appliances, at retail locations, logistics centers, and in the workplace –all connected by the internet– will have a dramatic impact on both the home and work environments. 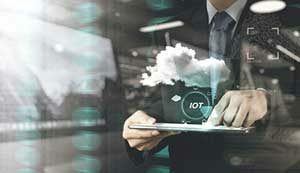 Figures on how vast the IoT already is vary, but experts predict there will be between 20-30 billion connected devices by 2020. Gartner estimates that the IoT is growing by a mind-boggling 5.5 million things every day. Home-based products like Google Home and Amazon Echo are already here and flourishing, demonstrating that suppliers and consumers alike believe in the power of the IoT. 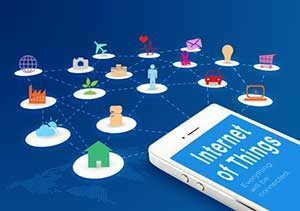 As discussed below, the IoT similarly provides a wide range of significant benefits for small businesses that demand your attention. Another impressive feature of the IoT is its accessibility to users. Most of the products and systems discussed below are available via apps and can be accessed on desktop and mobile devices. “Knowledge is power” is a maxim that applies well to business and life in general. With the unstoppable expansion of the IoT, the ability to monitor and collect all types of customer and performance-related data has improved dramatically. This timely information is now available through the use of interconnected devices used by companies of all sizes, as compared to the more exclusive use of expensive business consultants or market research firms. In addition, the cloud makes it possible for smaller companies to use and store this valuable data safely without the need of multiple expensive servers. The IoT and smart technology will enable businesses of any size to easily monitor and access customer demand and overall purchasing behavior. With this useful information, companies can more effectively tailor their offerings to their customers using more effective advertising and promotional offers. Businesses will be better able to know what their various types of customer want to buy, when they want to buy it, and how much they are willing to spend. The IoT will also improve the speed of the entire purchasing process. Advanced sensors will let customers know when their products are becoming defective and need replacement. Being able to collect and use this valuable information will lead to a more productive relationship for both the buyer and the seller. When small businesses have access to this consumer information, it will also speed up the entire market research process and accelerate the development of more products and services that their customers want. The IoT will dramatically improve the ability of small businesses to monitor and manage their entire inventory process. Smart devices and the IoT are increasingly making it possible to track and manage items automatically and enhance overall warehousing and logistics efforts. This comprehensive method is more efficient than the more cumbersome and expensive task of workers manually scanning and tracking inventory one piece at a time. As in the home, the cost of operating an office is a major expense that the IoT can reduce significantly. There are a variety of products available through the IoT such as the Nest thermostat, which automatically controls energy usage and interacts with smart light bulbs, connected appliances, and other devices to streamline the cost of utilities. The IoT will also make it much easier and more efficient to buy office supplies and cut down on waste through the use of automatic reordering of necessary products. The IoT makes it easier for workers to share information and collaborate effectively no matter where they are located. Through the IoT, important data is collected and updated continuously and with the touch of a button this information can easily be shared with all relevant team members. A variety of wearable devices also make it possible to better monitor worker performance analytics and make it easier to provide specific data to improve operations at all locations. As discussed in previous blog posts, workers tend to be happier when they have remote working options. As the IoT improves the capabilities of remote working, it will also correspondingly raise employee morale. For all its significant benefits, the IoT does have one serious drawback: it makes cybersecurity more difficult. Simply put, the more portals and connections there are, the more opportunities exist for cybercriminals to breach your network and gain access to sensitive information. This is a serious threat that will continue to grow in tandem with the expansion of the IoT. Equipped with this information, we recommend that you contact a trusted IT Support provider, like Network Depot, to learn more about the Internet of Things. These proven experts will advise you on how to best utilize this game changing new tool to help your small business thrive. For assistance with the Internet of Things and any other IT-related issues, please contact us here at Network Depot.